Stuffed with feta, chickpeas and fragrant spices, Matt Basile and Kyla Zanardi’s recipe is quite honestly ideal for any time of day. While Eggs Benny and French Toast have a special place in our hearts and on our brunch table, we love when a recipe comes along that makes us think about the meal in a whole new way. Enter this Roasted Eggplant with Baked Eggs dish from Matt Basile and Kyla Zanardi’s cookbook Brunch Life. Meat-free and light on carbs, these baked-till-silky eggplant boats are stuffed with chickpeas, feta and all sorts of spices. That means they’re satisfying enough to double as breakfast-for-dinner… or breakfast-for-lunch… or even breakfast-for-midday-snack, if hunger permits. Sometimes — and I do stress the word sometimes — I’m in the mood for something a little less over the top when it comes to brunch. I’ve always loved cooking with eggplant. It acts like a sponge, absorbing all the wonderful flavours and spices that are used alongside it. Its texture can transform in so many ways, from crispy to soft and everything in between. Here, the firm and crispy eggplant skin holds a delicious stuffing, which includes the tender eggplant flesh. This dish is a great choice for a healthier baked brunch option that looks as amazing as it tastes. Butcher your eggplant: Preheat the oven to 425°F and line a baking sheet with parchment paper. Slice the eggplants in half lengthwise and score the flesh with multiple Xs. Place the eggplant halves cut side up on the prepared baking sheet, season with salt, and drizzle with 1 tablespoon canola oil. Roast the eggplants for 40 minutes, or until the skin is crisp and the flesh is soft and easily scoopable. Remove the eggplants from the oven and allow to cool for 5 minutes. (Keep the oven set to 425°F.) Using a large spoon, and being careful not to break the skins, scoop the eggplant flesh into a bowl. Leave the skins on the baking sheet and set the flesh aside. In a large frying pan, heat the remaining 1 tablespoon canola oil over medium-high heat. Add the onion, garlic, and chickpeas. Sauté for 5 minutes, or until the onions become translucent. Turn the heat down to low and add 2 tablespoons tahini, the lemon juice, onion powder, curry powder, and salt; stir well to combine. Add ½ cup parsley and the reserved eggplant flesh and mix well. Remove from the heat. Start scooping: Spoon the eggplant and chickpea mixture into the eggplant skins. Use the back of a large spoon to make a divot in each eggplant half. Crack the eggs into the divots. Transfer the baking sheet to the oven and bake for 6 minutes for very runny yolks or as much as 15 minutes if you like your eggs baked completely through. Dig in: In a small bowl stir together the olive oil and the remaining 1 tablespoon tahini. 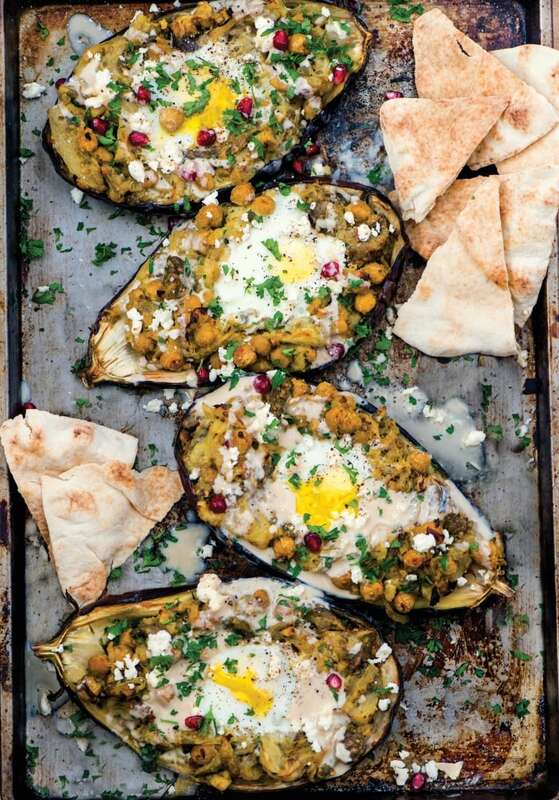 Serve the Roasted Eggplant with Baked Eggs on a large platter, with toasted pitas on the side. Garnish the eggplant with the tahini drizzle, pomegranate seeds, feta, and the remaining ¼ cup parsley. Excerpted from Brunch Life: Comfort Classics and More for the Best Meal of the Day by Matt Basile and Kyla Zanardi. Copyright © 2018 Matt Basile and Kyla Zanardi. Published by Penguin Random House Canada Limited. Reproduced by arrangement with the Publisher. All rights reserved.